In 1843, Joseph Robidoux, a fur trader who had long been associated with the area, founded Saint Joseph, Missouri. In a short time, families planning to settle in the new town began to arrive. Some of these newcomers, especially those who had come up the Missouri River by steamboat, found it difficult to find places to live while their new homes were being built. To meet the need for temporary housing, Robidoux built a series of seven connected houses, or apartments, on the north side of his new town. Begun in the 1840's and completed in the late 1850's, the structure was soon given the name of Robidoux Row. Sometime in the late 1850's, probably soon after the death of his wife Angelique in 1857, Robidoux himself moved into a unit in the eastern section of the building. He lived here until his death on May 27, 1868. Today, after having survived many years of neglect, the four remaining units of Robidoux Row have been restored. The portion designated as the east building is now a house museum. 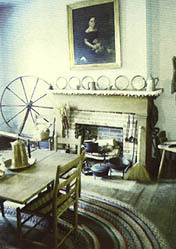 The museum includes a restoration of Robidoux's personal quarters, furnished with some of his own belongings and other period pieces, and a wintering room that appears much as it may have when it was providing shelter for a pioneer family on the move. Although intended for modern use, the west building has been equipped in keeping with its historical significance and includes Robidoux's possessions and memorabilia as well as appropriate Saint Joseph History.